Last Game: Saturday, December 17 at home against Springfield, the Pens won 4-2. The Penguins complete a span of six games in nine days where they win five of them. Fifth straight win for the Penguins. Oskar Sundqvist and David Warsofsky scored goals for the Pens in the win. 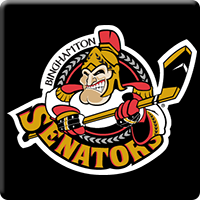 For Binghamton, the Senators were in Albany last Wednesday and lost 7-1. Jack Rodewald scored the only goal for the B-Sens in the loss. Last Meeting: November 4 in Wilkes-Barre, the Penguins won 4-1. Tom Kostopoulos and Garrett Wilson both had a goal and an assist each in the game. Why you should care: Trap game for the Penguins coming out of a long Christmas break. The first place Penguins have a lot of teams in hot pursuit of first place in the Atlantic while Binghamton has toiled at the bottom of the North for much of the season. The Penguins cannot take the Senators for granted or else. Other Game to Watch: Coming out of this Christmas break a team to watch will be Bridgeport. The Sound Tigers have dropped their last four games. The Sound Tigers host the Hartford Wolf Pack tonight.